The next generation of cancer treatments is now being tested in the clinic and is showing that decades of research will result in real results. Research from the Perelman School of Medicine at the University of Pennsylvania used new techniques to train the immune system to attack tumor cells after people were diagnosed with ovarian cancer and were in advanced stages (stage 3-4) of the disease after other treatment options did not work. The research was presented at the American Association for Cancer Research meeting in Washington D.C. In order to create the personalized immunotherapy, doctors and researchers took live samples of tumor cells from patients and then purified dendritic cells from patients' blood. 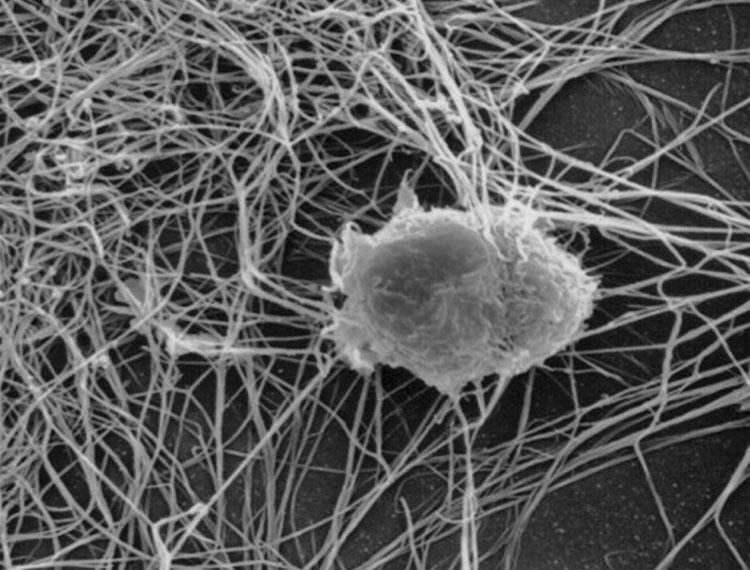 Dendritic cells are sentinels in the body and sample the environment constantly, alerting other arms of the immune system of infections and calling them to action. The dendritic cells are then exposed to the tumor cells in a laboratory setting and when these immune cells are injected back into the patient, they tell the immune system to recognize and attack tumor components and kill the cancerous cells. In a study of 31 patients the vaccine therapy showed a clinical benefit in 61 percent of patients. When the researchers combined the vaccination technique with a transfer of another type of immune cells called T cells, the benefit jumped to 75 percent. Amazingly, one patient achieved complete remission from her cancer, even though previous treatments all failed. Both treatments were given in conjunction with the cancer therapy Avastin, which blocks blood vessel growth that cancers need to thrive. Ovarian cancer is not usually caught until it has spread to the lymph nodes because the symptoms seem benign, such as constipation, weight gain, bloating, or more frequent urination. Ovarian cancer is the fifth leading cause of death in women and kills 14,000 women a year. "Given these grim outcomes, there is definitely a vast unmet need for the development of novel, alternate therapies," said lead author Dr. Lana Kandalaft, PharmD, PhD, MTR, a research assistant professor of Obstetrics and Gynecology and director of clinical development and operations in Penn Medicine's Ovarian Cancer Research Center. "This is the first time such a combination immunotherapy approach has been used for patients with ovarian cancer, and we believe the results are leading us toward a completely new way to treat this disease." More information about the study can be found from the American Association for Cancer Research.